Part 3 concluded with the return of Ottoman rule to Palestine and a burgeoning Arab nationalist movement. The mid-1800’s was a period of rapid global modernization. The effects of this modernization were felt significantly in Palestine and were facilitated by three major forces that would ultimately shape the region significantly: 1) Increased government (Ottoman) role in local affairs; 2) the European-dominated world market; and 3) Zionism. When the Ottomans regained control of Palestine, they had no interest in returning to their old method of nominal rule that entailed little control over the affairs of the region. Inspired by how lucrative the Egyptians had made the region by following the European example, they tried to emulate this success in their own way. To accomplish this, they introduced the Tanzimat (reforms), which involved multiple new policies. To improve the economic environment, the Ottoman authorities subdued the Bedouins (similar to their Egyptian predecessors) and halted all tribal warfare by means of force. They also instituted Mukhtars, who were central government designated chiefs that acted as Ottoman representatives in each region. Interestingly, at this time, Palestine had been split into different jurisdictions. 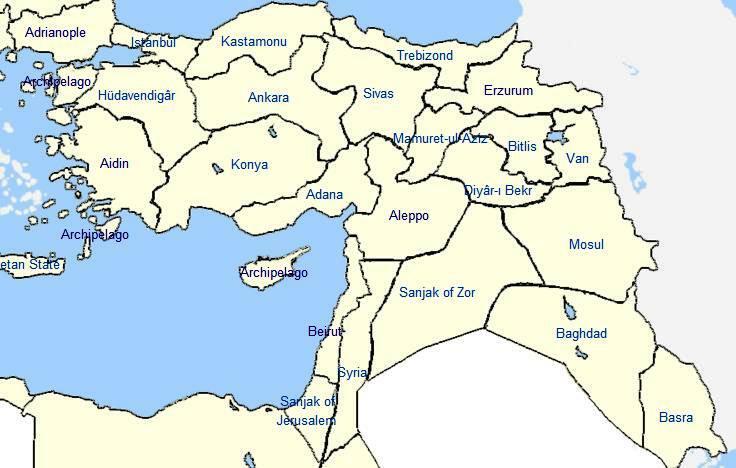 The North was part of the Vilayet of Beirut (encompassing a region that reached south, roughly as far as modern day Tel Aviv), the South was part of the Sanjak of Jerusalem, and the East (areas east of the Jordan River) was part of the Vilayet of Syria (see Map 1). The Ottomans also decided to continue the Egyptian policy of equal rights for minorities. This was partially owing to the fact that the current population was actually shrinking due to rampant disease and food shortages —something that did not abate until the advent of better farming technologies and introduction of medicine (both of which being introduced by foreign settlers and merchants). The most important reform was the introduction of title of ownership to land, something the Ottomans called Tapu. This concept was entirely alien to the people of Palestine. Previously, ownership was demonstrated purely through cultivation of the land itself. Tapu required the creation of a centralized land register, something that was unsurprisingly to remain in the hands of the Mukhtars—a key instrument for preserving Ottoman control of the region. The people who benefited most from this new environment were the Ayan, local notables who had previously been hurt by the Egyptians’ tax centralization scheme. The Ayan would buy up ‘unregistered’ land on the cheap and turn previously small individual land holdings into large estates. Often, the Ayan would sell their holdings to incoming settlers. This practice drove up the price of the land, allowing them to turn a quick profit. Many of the newcomers who purchased the land were Zionists (something that will be discussed further below). This land redistribution ended up furthering inequality, as the rich (both the Ayan and the more powerful Palestinian clans) would end up with large properties or massive profits from sale, while the poor could only cultivate their smaller portions of land. It was at this point that a notable split between those living on the flat fertile lands of the Palestine’s West and the unfertile hills in Palestine’s East began to emerge. While the West became the domain of wealthy landowners, the East remained the last refuge for poor farmers to maintain their smaller holdings. During this same period, the world economy became increasingly more globalized and European markets began to dominate the local markets of many new locales, including that of Palestine. As a result, Palestine, which was an area previously focused primarily on subsistence farming, saw a shift towards the production of more specialized goods. This allowed local producers to take advantage of the higher prices found overseas. The creation of larger farms in the hands of the rich only served to push this specialization of production along even faster. Those who benefitted were, again, the wealthy Muslim landlords, but also the Christians who had stronger connections with Europeans and thus had better access to their markets. To the Europeans, Christians were familiar and therefore, more trustworthy trading partners, in an otherwise exotic region. Since ancient times, a minority of Jews had remained in Palestine. In fact, Jerusalem’s population was approximately half Jewish before any major population of newcomers had settled there. But, as the end of the 19th century approached, more and more Jews began to come to Palestine for a multitude of reasons. The Jews were being persecuted in many of the countries that they were currently settled in. Thus, they had good reason to move to Palestine where their rights were, although imperfectly, still better protected. Additionally, by bringing with them advanced technology and modifying it to local conditions, they could make use of swaths of land that local fellaheen could not. The population of Palestine at this time was still quite low due to the factors discussed previously, with about 500,000 people in the entire region circa 1880. During this period, many Ayan were happy to sell their land to incoming Jews for sizeable profits, giving the Jews the means to start a new life in Palestine. Finally, the religious imperative was most definitely an important driver for many of the newcomers, despite the fact that a formal and organized Zionist movement had yet to form. The dream of a return to the ‘Promised Land’, the land of Zion, had never faded within Jewish culture even after so many years of exile. However, the Jews were not the only settlers to come for religious motivations. Settlers also included many Christians, especially German Templars. The Jews settled mainly on the coastal plains; while the majority of the Arab population remained in-land throughout the hills of Eastern Palestine, further deepening the above-noted divide between the two regions. The first Aliyah (1882 – 1903) – the first major wave of Jewish settlers– is usually regarded as the ‘farmers’ Aliyah,’ since most of the settlers engaged in agricultural activity once they arrived. They cleared and dredged much of the coastal land that had been neglected by the Arabs. Interestingly, this resulted in a movement of many Arabs westward to the coastal plains due to increased economic opportunity. The advanced agricultural practices of the newcomers, which were also adopted by the wealthier Arabs (both Muslim and Christian), in combination with the burgeoning export market, resulted in fellaheen agricultural practices falling behind the curb. As the cities began to boom, the reverence for the ‘mythic old life,’ or ‘the way it used to be’, within the fellaheen community became ever more pronounced—something that perpetuates to this day. Over time and due to mounting distrust, the Arab and Jewish economies began to separate as their respective nationalist movements grew. By 1908, 10% of the population of Palestine was Jewish, a mix of both newcomers and the minority that had remained in Palestine since ancient times. In addition to a growing Jewish population, Palestine’s population as a whole was growing significantly thanks in large part to the improved medical practices and food availabilities that came with Western innovations. At this point, Palestine was on the cusp of a startling transformation. After hundreds of years of Ottoman control (even during the period of Egyptian suzerainty, the Ottoman Empire was still the formally recognized ruler of the region), Palestine was about to fall into the hands of an entirely different world power. 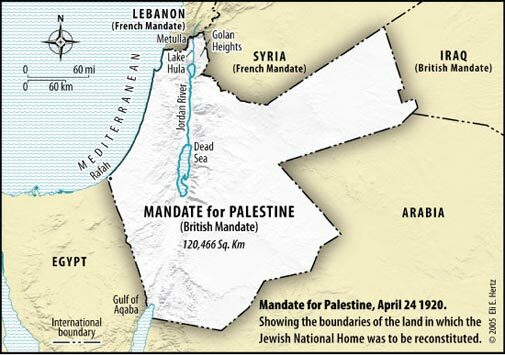 After their victory over the Ottomans in World War I, the British and the French carved up the Middle East between them, leaving Palestine as a Mandate of the British Empire (See Map 2). This was to have numerous consequences for the people and the two nationalist movements (Arab and Jewish) blossoming in Palestine. It is during the interwar period that a starkly Palestinian nationalism, as opposed to Arab in general, begins to form. Part 5 will cover this momentous period, and discuss how Palestinian nationalism in its distinct form began to take shape. This is a short description of Palestinian history. What can you add? « Guest Writer: Cyberbullying – Where Do We Go From Here?